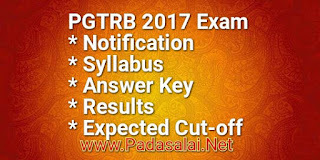 Tamilnadu Teachers Recruitment Board announced PGTRB for the year 2017. The Notification is issued in the official website. This exam is conducted to fulfill the 1663 vacancies through out tamilnadu. The PGTRB exam online applications apply - starts from May 10, 2017 onward. The last date for the submission of application through online mode is May 30, 2017, Time: 11.59 p.m. The cost of exam fees is Rs. 500. Post Graduate with B.Ed., in the concern subject is the eligible for applying PGTRB Exam. Two degrees at a same academic years could not be the eligible to apply. The candidates who an having equivalent degrees can apply for the exam for the related subject. The candidates should be answered 150 questions. In this content 110 marks covered only on their major subject 30 marks from psychology. Teaching attitude and the 10 marks from G.K. The candidates will be selected on the basis of the cut off marks.